Over the summer four teachers from Deer Valley Elementary, two from Oak Mountain Intermediate and two from Homewood City Schools embarked on an eight-day journey across Alabama to learn more about the state’s bountiful biodiversity and natural beauty. Photo special to the Journal. 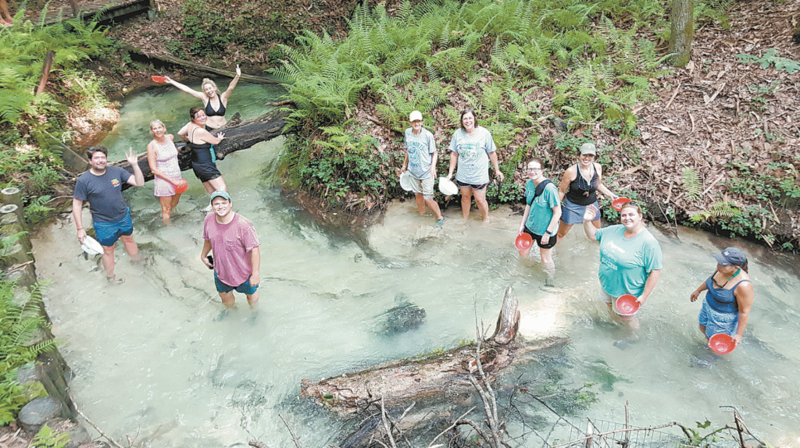 Over the summer, 21 teachers embarked on an eight-day journey across Alabama to learn more about the state’s bountiful biodiversity and natural beauty. Of those, eight were from the Over the Mountain area, including four from Deer Valley Elementary, two from Oak Mountain Intermediate and two from Homewood City Schools. Those two Homewood teachers, Lisa Lucas of Shades Cahaba Elementary and Lynn Hardin of Homewood High School, caught up with the Over the Mountain Journal to share their experience on the trip and how it influenced them to allow new lessons about conservation and the environment to take root in their classrooms. The annual trip the eight teachers attended was “Mountains to the Gulf: Teachers Making Connections,” which lasted between June 24 and July 1. The group started at Winston County’s Camp McDowell in the northwestern part of the state. Over the next eight days, a charter bus transported the educators down through some of Alabama’s most notable natural wonders. During the course of their journey, they reached Alabama’s highest point in Cheaha State Park, kayaked the Tallapoosa river, examined the lush greenery of Solon Dixon Forestry Education Center and studied acquatic habitats at the Dauphin Island Sea Lab near Mobile. “This teacher training used our state’s best resources and the passionate, highly educated people that love it to not only teach us, but to show us what we should be celebrating and how to get others to celebrate too,” said Lucas. Lucas, who previously had experience teaching special education and first grade before becoming an art teacher, claimed she intially had trouble finding meaningful professional development courses for her art curriciulum before this trip. She even tried getting involved in the Greater Birmingham Math Partnernship to “stretch her abilities and comfort zone” despite math not being her strong suit. When Dr. Patrick Chappell, director of instructional support for Homewood City Schools, brought Legacy’s Mountains trip to the Gulf to Lucas’ attention, she was game to try something fresh for her classroom. Hardin, who has taught science education for 25 years, said though she had a strong foundation in Earth science, she was looking forward to getting firsthand experiece in geological fieldwork by trained experts. Both spoke on the rare opportunity the trip offered in getting to know and learn with educators of all backgrounds and ages. According to Hardin, it was refreshing to be around educators of several disciplines and areas of study. Of all the excursions the group went on, Hardin picked their stop on Mt. Cheaha as her favorite. While there, the group examined pure quartz cutting through the rugged sandstone of the mountain. “Mt. Cheaha and the rest of the Appalachians were formed when the large land masses collided to form Pangea. To ‘know’ this is one thing, but to see visual evidence in person of the great pressure needed that had to have melted the rock enough for pure quartz to recrystallize was amazing,” said Hardin. Hardin explained she looks forward to implementing more field experiences in her curriculum. She said she may take her students to survey the rocks in Shoal Creek near Homewood High School that, through the natural process of the rock cycle, will one day become the sand on Alabama’s beaches. She even pointed out a geological history lesson that can be observed as Birmingham residents drive down the Red Mountain Expressway. Further, both look forward to highlighting the importance of conservation and ecology in their classroom lessons as well. “It’s my job to foster awe, wonder and discovery of our states’ ecology so that the future generations can pursue careers to discover the unknown, find ways to increase revenue, outshine our sordid history and lead the world in saving ecosystems,” said Lucas. Hardin agrees. “This is our home. You don’t trash your home. You take care of it because it is yours. We have a responsibility to future generations to make sure they have a home that is beautiful and as healthy as it can be. Human life depends on our understanding of our planet and being good stewards of this gift that has been given to us,” she said. For those looking to learn more about Alabama’s natural wonders on their own, Legacy offers plenty of free resources and information on their website legacyenved.org/.